The indirect feeding system, FLEXFEED®, is a unique feature in Xergi’s biogas plants. It is based on a combined feeding, heating and mixing module. A unique feature in Xergi’s biogas plants is the indirect feeding system, FLEXFEED®, which is based on a combined feeding, heating and mixing module. The market for feedstock can change from time to time. Therefore, with regard to operating profits, it is important that there is a flexible feeding system in place. Xergi’s FLEXFEED® feeding module ensures precisely this level of flexibility. Due to highly precise feeding of the individual biomass, the biological balance in the digester is guaranteed to remain at its most efficient level, even with large variations in the feedstock. This flexibility provides a firm foundation for investment in a biogas plant. Furthermore, the module also allows for the possibility of pasteurisation of the biomass, making it possible to process category 3 by-products. Because the biomass is heated, separated and mixed before entering the digester, a homogeneous consistency is achieved, which provides a more efficient breakdown process and a higher gas yield. The feeding module is able to weigh the biomass with a high degree of accuracy. This makes it easy to obtain the correct feeding of biomass with very different energy contents, without harming the biological process. The biomass is heated in the feeding module, which makes heating the digester unnecessary. This eliminates the need to empty the digester when the heating system needs to be serviced or repaired, thereby reducing the risk of lost production. When biomass is mixed, homogenised and pre-heated in the feeding module prior to entering the digester, the risk of foaming, which can cause problems in the digester, is reduced significantly. Foaming can otherwise lead to reduced productivity and large cleaning expenses. 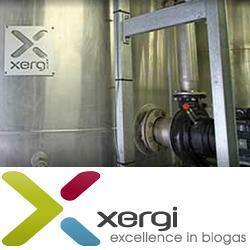 Xergi’s indirect feeding system also prevents harmful airflow into the digester.